Sometimes, the map is the memory. 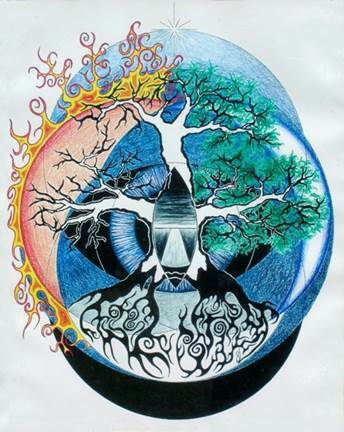 I read somewhere once that the shaman’s song guides her across the landscapes of the soul. Her telling of the tale, reciting the journey, makes the power real. Sometimes, the map is the territory. When I read Verlyn Flieger’s A Question of Time, the same reality came to mind. Tolkien took his experience in the trenches and made it real on the plain of Dagorlad, remembered the dead back into a life of corpse candles, transfigured madness through the retold pain of the Rhinegold’s possession. glazed with grimy glass, through which he was peering. Now I find the map is all: mind and mulch and mulling words woven into a texture of understanding molded by thought’s touch. It is how the moment feels that is real. the truths from my heart. I came to Tolkien’s meanderings at a time when madness marked every corner of my mind-home. I grew up the only son of a schizoaffective  single mother. For nine years, between ages 9 and 17, I was her only trusted confidante, doing my best to rein in the extremes of her delusions and paranoia. I lived with the fear of death, guarding against being orphaned by suicide, yet girding myself for a cross-country trek I secretly hoped would be my release. Instead, reading my way through Middle Earth kept me grounded in a fantasy more true than the reality I was surviving. er manngi veit hvers af rótum renn. where no one knows where from its roots run. hlýdda ek á manna mál. I listened to them speak. This intertextuality laid under English and Norse reminds me of a Borre-style “gripping beast” replica I own. 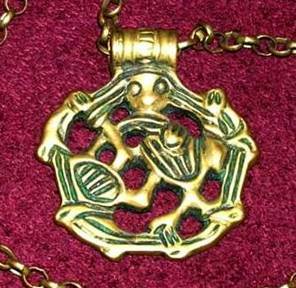 While James Graham-Campbell describes the original 10th century pendant as “formed from a single beast with its…ribbon-shaped body…in an arc beneath the mask-like head,” my first impression was that the bronzework I possess showed a skeleton dismembered and bound upon a wheel. As that binding gnawed further upon my subconscious, I later discovered a link between Old Norse words for physical fetters and the family ties of kinship and obligation. The cord shall tear and the greedy-wolf run. Against this fate, the ourobouros bends backward to bite its tail. Knotwork arms interweave, hands clasp, teeth clench. The wheel of the world holds us in thrall, yet keeps us from drowning. Do we sing up, or dare we sein down, as we haul the sea of souls across time-calloused hands to finger the frets in wyrd’s weaving? What context holds us? What spells become us? Whither do we run from stock to stone? How keen shall we hone what once was ours? I will point only to one fact which connects The Lord of the Rings to Old Norse heroic and mythical literature. It is deeply sad, almost without hope. The story is not a quest, about finding something, it is an anti-quest, about throwing it away. The price of throwing it away is extinction. The elves will disappear. So will the ents, and the hobbits. Frodo, the hero, is incurably wounded. He is taken away across the sea, but only to die. 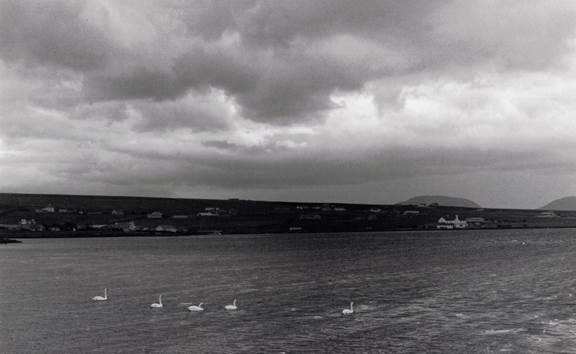 The dominating word of the last page of the story is “grey,” as the other characters ride back unspeaking on “the long grey road” from the “grey firth,” and the “grey sea,” and the “grey rain-curtains,” and the Grey Havens. Something has gone out of the world, and it will not come back. And that is how things have always been. Never have I sailed the fjords of Norway, nor stood at Þingvellir, nor dwelt among the downs and verdent barrows of England. My home has been the woodlands and wetlands of North Carolina, with its summer thunderstorms and winter rains. But my mind knows the language of another land, my heart roves the hard-twisted words of those whose lives were handed down from one tongue to the next. I ken what I can. Myth becomes dead reckoning for the soul, singing us back from where we’ve wandered — even from the marches of the uncontested lands of the dead. Memory is the map speaking the spell. What words are woven tell only the times that they remember. It is not for us to impose order on that which has its own. Only to learn the routes through hard-won truths, plumbing the depths as we go. Verlyn Flieger. A Question of Time: J. R. R. Tolkien’s Road to Faerie. Kent State University Press, 2001. J.R.R. Tolkien. The Two Towers. 2nd edition. Boston: Houghton Mifflin Company, 1982. 235. After lines 9-11 and 15 of The Wanderer: “Nis nu cwicra nan / þe ic him modsefan minne durre / sweotule asecgan. … Ne mæg werig mod wyrde wiðstondan.”. Schizoaffective disorder is characterized by a mixture of schizophrenic symptoms and mood imbalances, such as depression or mania. It is not schizophrenia, per se. Hávamál 138. Eddukvæði: Sæmundar-Edda. Ed. Guðni Jónsson. Heimskringla: Norrøne Tekster og Kvad. 2005. Richard Cleasby and Gudbrand Vigfusson. An Icelandic-English Dictionary. London: Oxford University Press, 1874. Germanic Lexicon Project. 2004. Hávamál 111. Eddukvæði: Sæmundar-Edda. Ed. Guðni Jónsson. Heimskringla: Norrøne Tekster og Kvad. 2005. Karen Bek-Pedersen. The Norns in Old Norse Mythology. London: Dunedin Academic Press, Ltd. 2011. 150-153. James Graham-Campbell. The Viking World. New Haven: Ticknor & Fields. 1980. 136. After lines from Völuspá 35 and 44: “Haft sá hon liggja und Hveralundi” and “festr mun slitna en freki renna.” Völuspá. Eddukvæði: Sæmundar-Edda. Ed. Guðni Jónsson. Heimskringla: Norrøne Tekster og Kvad. 2005. Dan Campbell. 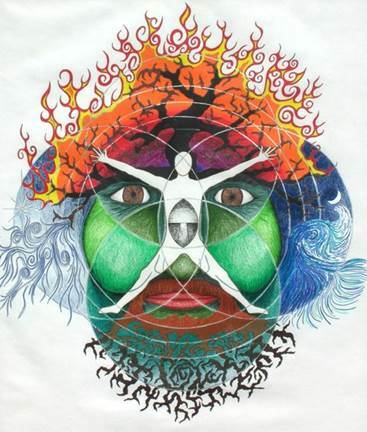 “The Bound God: Fetters, Kinship, and the Gods.” Idunna 89, Autumn 2011. 24-29. Dan Campbell. “Feeding the Wolf: the Theme of Restraint, and its Lack, in the Mythology of Fenrir.” Idunna 91, Spring 2012. 20-24. Tom Shippey. “Tolkien and Iceland: the Philology of Envy.” Tolkien, Laxness, Undset. 13 Sep 2002. de-vagas em hy-brazil. .
 “The Creation of Éa.” In: Ursula K. LeGuin. A Wizard of Earthsea. New York: Bantam Books. 12th printing. 1979. Dan Campbell‘s work has appeared in Stone Telling, Goblin Fruit, Niteblade, Fantastique Unfettered, Mythic Delirium, and Daily Science Fiction. 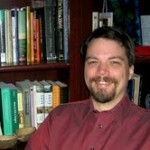 He edits poetry for Bull Spec magazine in Durham, NC and ruminates on LJ at http://art-ungulate.livejournal.com.